Looking for a Walk-In Shower in Cottage Grove, OR? Independent Home Products, LLC has been proudly installing walk in tubs and walk in showers in Cottage Grove, Oregon since 2007. For over 12 years we have been increasing our customers' bathroom safety and independence by installing walk in showers in Cottage Grove. Our walk in showers are every bit as attractive as they are functional. What's more, when you call Independent Home Products, LLC to install your walk in shower, you'll receive superior customer care and an expert in bathroom safety. Give us a call today for a free walk in shower quote and you'll quickly see why we're the top choice for walk in shower installation in Cottage Grove! 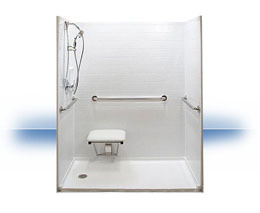 When it comes to affordable, safe and high quality walk in showers in Cottage Grove, OR, Independent Home Products, LLC is the provider for you!